I took this picture at Applebee’s in Jupiter, Florida during karaoke night and am still in awe with how well it turned out. I’ve never captured this much depth before. If you still have your red/blue 3-D glasses, have them handy when you visit this page.You’re about to make simple drawings in living, floating 3-D. You’ll be able to rotate and zoom your drawing, but be sure to duck so you don’t get hit by your artwork. Your desktop in a 3-D cube. Yod’m 3D turns your desktop into a rotating cube that allows you to set up separate desktops on all 4 sides of the cube. When you want to switch desktops, just push the hotkey and the cube will rotate to the next desktop using some very nifty 3-D effects. There are lots of settings to play with, including transparency and zoom effects to make this gem both useful and fun to play with. Although Yod’m has gone payware, you can still download the freeware version at Portable Freeware’s site. Microsoft has released a 3-D edition of their famed Office suite. 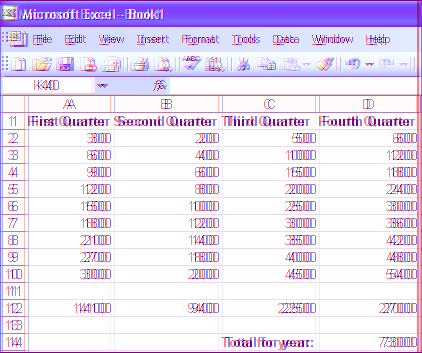 Now users can create documents with words that jump out of the screen, spreadsheets with literally floating numbers and presentations featuring in-your-face graphics. A pair of red/blue viewing glasses are included although additional glasses can be purchased through licensing upgrades. The 3-D house of horrors. I’ve come up with yet another approach to 3-D art, one that can be a little scary. I have a bunch of those little LED flashlights, including one with a red light and one with a blue light. One night I put on my 3-D glasses, turned out the lights and walked around the house with the red flashlight in my left hand and the blue flashlight in my right. As I walked from room to room, I shone the two flashlights on the various furnishings in my house. What I saw was terrifying. I saw shadows literally floating in mid-air, at times appearing to jump out at me. I’d never seen anything like it. Then I decided to try taking pictures of these floating shadows to prove to myself that I am not going insane. 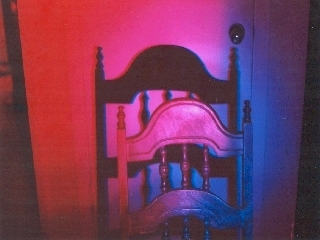 This first picture is of an ordinary dining room chair. 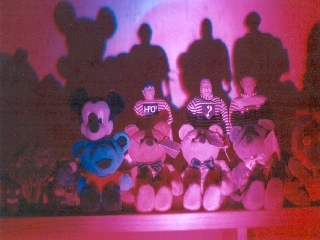 When seen with the 3-D glasses, the shadow does appear to be floating in mid-air. This is a shadow of the glass lamp that hangs in my dining room. 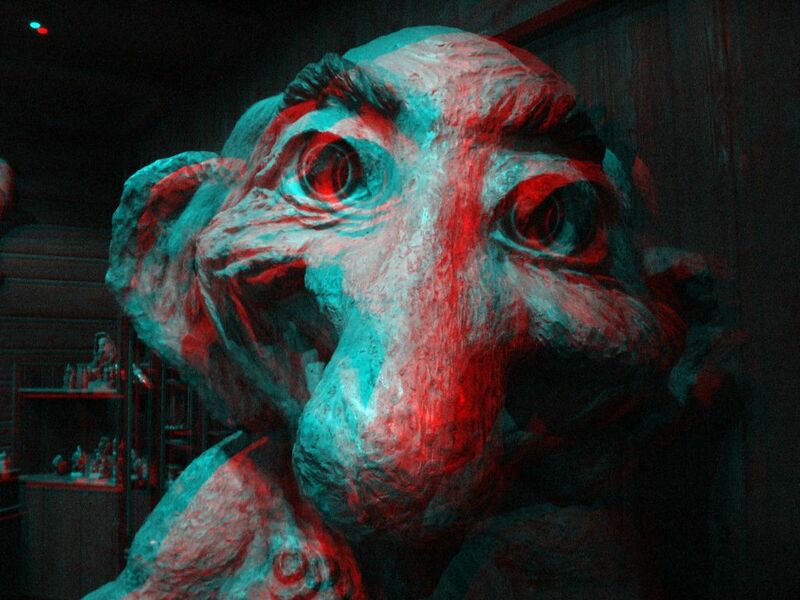 When I saw it through my 3-D glasses, I was spooked. 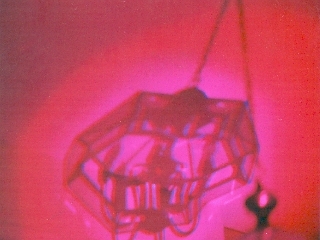 The lamp appeared to be floating in mid-air around the room, growing in size and appearing to headed directly for me. It’s a good thing it’s only a shadow. 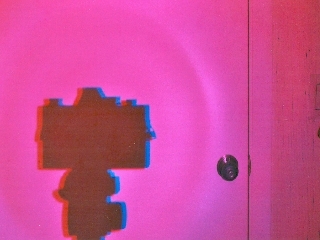 Here’s a shadow of my camera on its tripod. Again, when seen in 3-D, it appears to float in mid-air to take on a new life of its own. And finally, here are some of my toys which grace the top of my desk. The shadows here cast an ominous and eerie tone, quite uncharacteristic of their normally innocent presence. Wow. What a creepy night. I’m not sure if I want to do this again. 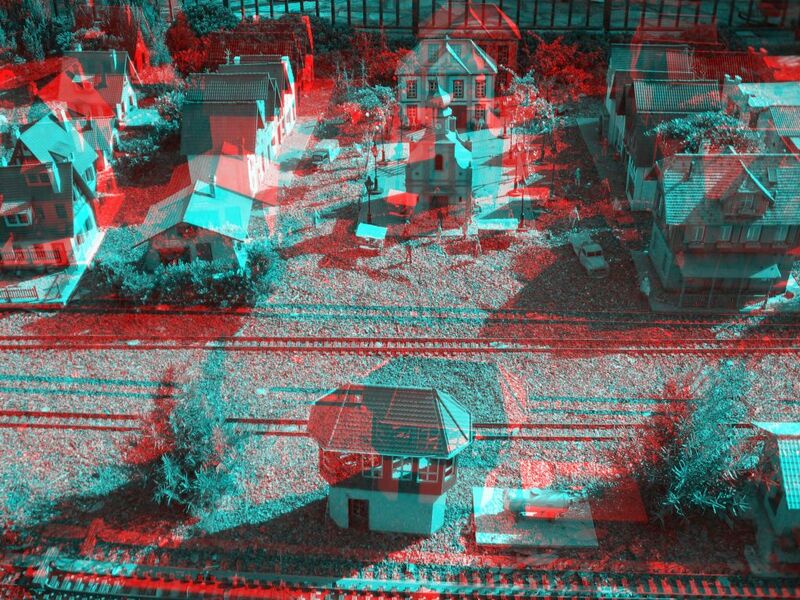 Welcome to the 3-D neighborhood. 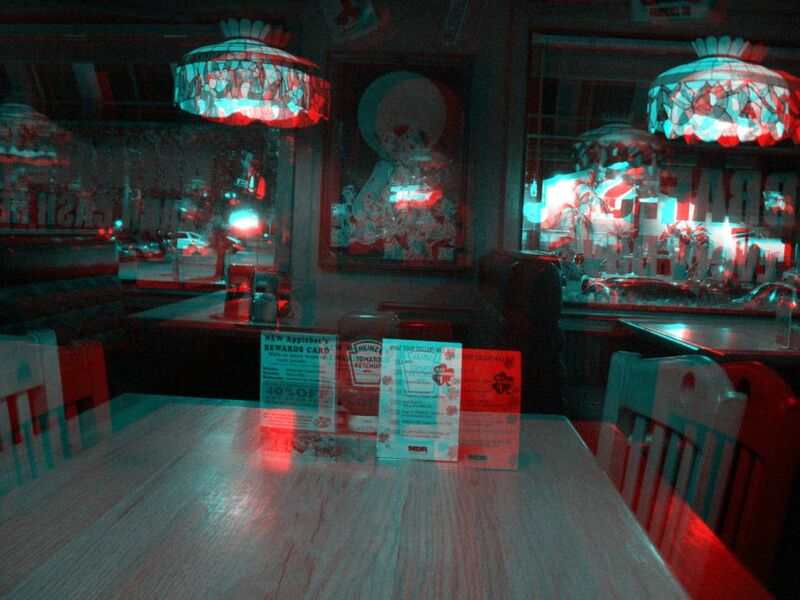 As promised, here’s another 3-D picture for you to feast your eyes on. This time I used my digital camera. This picture shows the sidewalk that runs between the houses in my neighborhood. After taking the first picture, I moved the camera about an inch to the right and took the second picture. 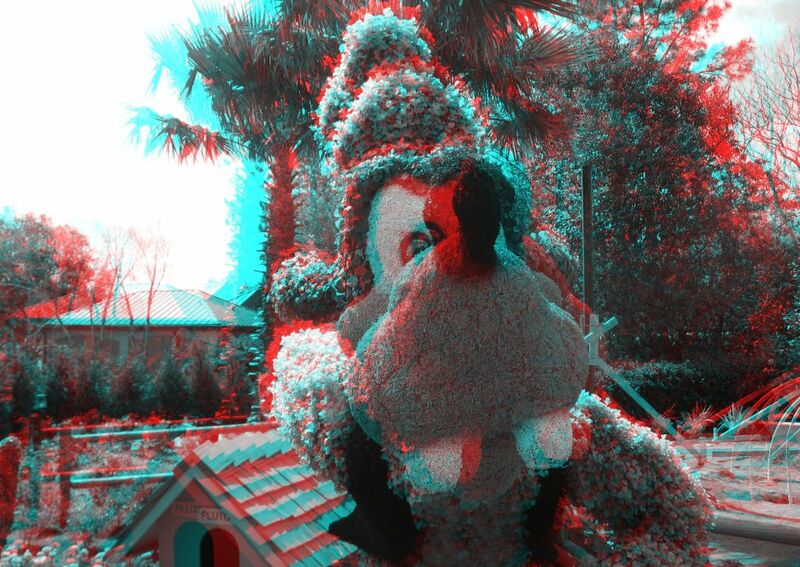 Then I used the Anaglyph Maker to produce the finished product. 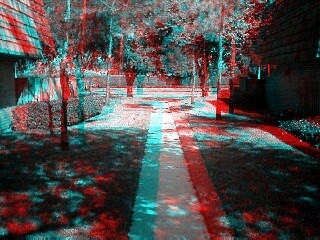 I have plenty of 3-D pictures to post, so be sure to check back often with your 3-D glasses in hand.